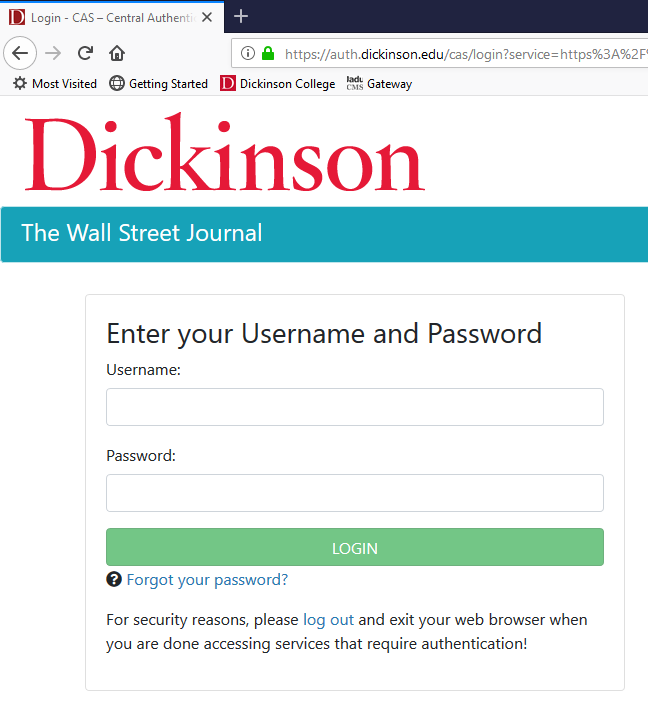 The library's Wall Street Journal subscription allows current Dickinson students, faculty, and staff to access the paper's online edition, whether on or off-campus via your smartphone. Offers current access to the Wall Street Journal online from 4 years ago to the present. 2. Enter your Dickinson login on the CAS authentication page, as shown. 3. On the WSJ.com registration page, enter your name and email address, and create a password. 4. Use your WSJ.com account from now on to log in to the WSJ.com web site or app. You may be asked to refresh your account on the anniversary of your registration with WSJ.com, in order to confirm your on-going affiliation with Dickinson. To do this, you must log in via this Dickinson-specific WSJ.com link, as you did when you first registered.